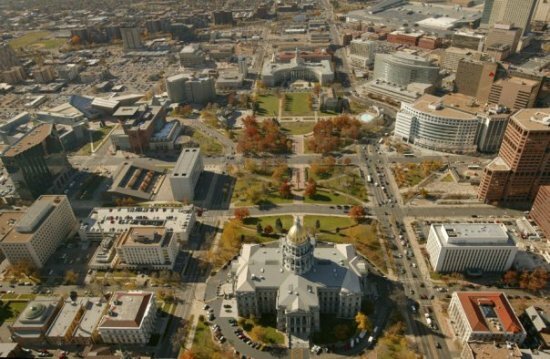 Last month, Mayor Michael Hancock said approval of the recommendation for Denver's Civic Center "would shine a spotlight on this city treasure and help to deliver Denver as a world-class city." Safety professionals by the thousands are converging on Denver, Colorado to attend ASSE's Safety 2012 at the downtown Colorado Convention Center. They're arriving just as a National Park Service advisory board considers a recommendation to designate the Denver Civic Center as a National Historic Landmark. The request went before the board May 22-23; if approved, it would be the first National Historic Landmark designation in the city, Denver Mayor Michael Hancock said. The Denver Civic Center is located in central Denver, south of the Central Business District at the intersection of Colfax Avenue and Broadway. The recommendation includes Civic Center Park, Veteran's Park, the McNichol's Building, the City and County Building, and the Colorado State Capitol. Hancock supported the recommendation May 15 during a meeting of the advisory board's Landmarks Committee. "Civic Center serves as the keystone for the entire Denver Parks system and sits literally where the city's cultural, community, and commercial realms converge," he said during the meeting. "For Civic Center to receive the honor of becoming a National Historic Landmark would shine a spotlight on this city treasure and help to deliver Denver as a world-class city." Lighthouse Writers' First Annual Book Fair! 40 West Arts - Inspire Week!